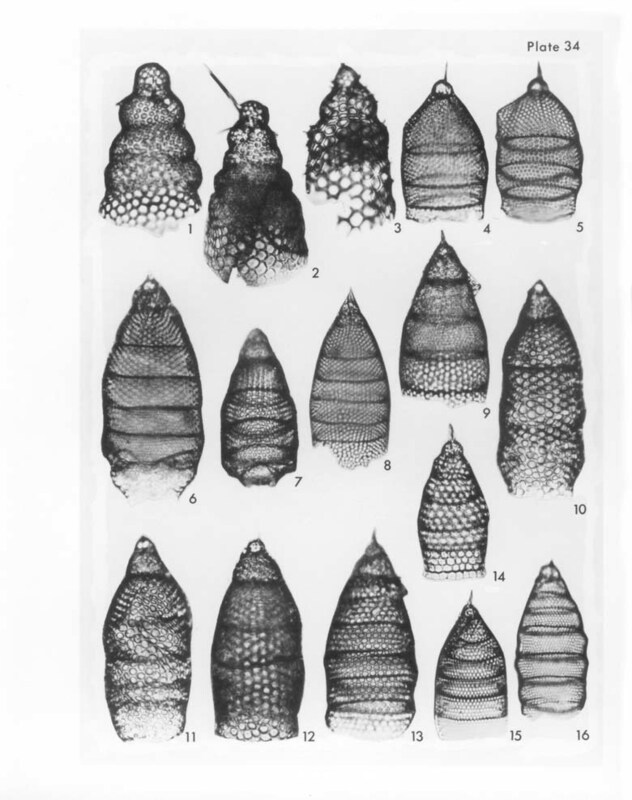 1-3 Lophocorys polyacantha Popofsky; 1, dorsal view, VS-R-106b, 1-3cm, F17/0, 300x; 2, right lateral view, VS-R-93b, 1-3cm, K28/2, 300x; 3, right latero-ventral view, VS-R-93b, 1-3cm, O35/1, 300x. 4-5 Eucyrtidium anomalum Haeckel; 4, ventro-left lateral view, focus on cephalis, VS-R-60b, 3-5cm, O46/0, 300x; 5, dorso-left lateral view, focus on thorax and abdominal joints, VS-R-60b, 3-5cm, Q47/1, 300x. 6-9 Eusyringium siphonostoma Haeckel; 6, basal mouth constricted, VS-R-60a, 3-5cm, K27/4, 300x; 7, basal mouth tubular, VS-R-71a, 1-3cm, F8/3, 300x; 8, dorsal view, focus on cephalis, VS-R-27b, 1-3 cm, F33/0, 300x; 9, focus on left primary lateral "wing", VS-R71a, 1-3cm, Y19/2, 300x. 10-12 Lithomitra infundibulum Haeckel; 10, septal rings regular, VS-R-71a, 1-3cm, E17/3, 300x; 11, septal rings irregular, VS-R-71a, 1-3cm, F14/2, 300x; 12, left lateral view, focus on cephalis and ventral tubule, VS-R-81a, 1-3cm, W26/3, 300x. 13-16 Lithostrobus hexastichus Haeckel; 13, larger intermediate-sized pores, VS-R-60b, 3-5cm, M45/2, 300x; 14, dorsal view, focus on cephalis, large pores, VS-R-60a, 3-5cm, S5/0, 300x; 15, smaller intermediate-sized pores, VS-R-60b, 3-5cm, E43/1, 300x; 16, small pores, VS-R-92a, 1-3cm, C20/4, 300x.